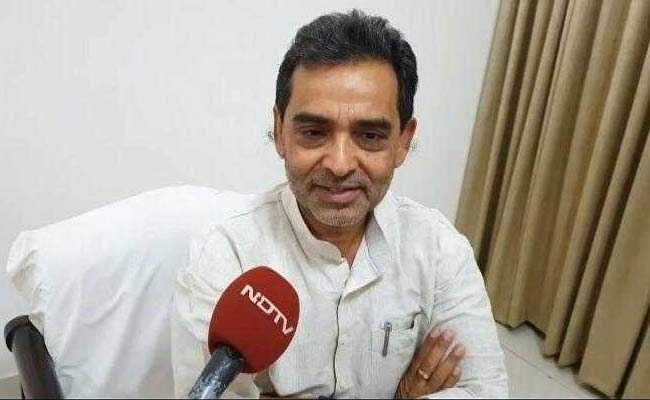 "Hope it does not happen that Nota crosses the majority mark in the next elections in Bihar", Upendra Kushwaha tweeted. Union minister Upendra Kushwaha has often expressed concern over the law and order situation in Bihar. Union minister Upendra Kushwaha, who has repeatedly been sending mixed signals about his allegiance to the NDA, has made yet another remark that has had critics predicting his exit. "I won't be surprised if NOTA gets the majority mark in Bihar," tweeted the minister, who triggered speculation about an overture to Lalu Yadav's party last month with his recipe for kheer. Mr Kushwaha's speculation about NOTA was preceded by a remark on two recent cases of murder, pointing at the law and order situation in Bihar. Earlier in the day, Mr Kushwaha 's supporters had hit the road and blocked the road in Bihar Sharif -- considered a stronghold of Nitish Kumar -- in protest against the kidnapping and murder of a bank manager. The RLSP leader's rivalry with the Chief Minister was reflected in another comment last month, when he said "a leader" in Bihar NDA did not want Narendra Modi to head the government for another term. Refusing to name anyone, he said they "intentionally spread rumours" to trigger conflict in the alliance. He also said he would reveal the leader's identity only to the Prime Minister and BJP chief Amit Shah. But his comment on NOTA is also seen as a dig at the BJP, which is part of the ruling alliance. Mr Kushwaha, party insiders indicated, has been unhappy over the share of seats earmarked for him. There has been no formal announcement, but the buzz is that Mr Kushwaha's party will be granted only two seats, the number it currently has. Nitish Kumar has been holding out for the same number of seats as the BJP -- which hopes to contest half of Bihar's 40 seats. With the message going out that the party won't accept anything less than 17, the BJP has gone back to the drawing board to accommodate him. The resulting restructure is expected to pare down the share of allies like Ram Vilas Paswan and may cut out Mr Kushwaha altogether. The Janata Dal United and a section of the local BJP leaders are unfazed. Mr Kushwaha's exit, they reason, will make no difference to the NDA's bottomline. They expect the RLSP leader to make his exit only after considering the results of the coming elections in three states.